With the change in the parish Mass schedule, St. Katharine Drexel Mission’s Religious Education classes will now be held at Bull Run Middle School starting at 9:15AM. 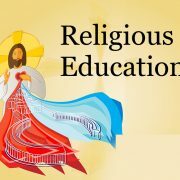 Religious Education classes begin on September 11. If you have already registered, you will receive a class assignment letter and calendar. If you have not yet registered, please do so as soon as possible; it takes approximately two weeks to process registrations, order books and prepare materials. We cannot accept walk-in students, so don’t delay. We are planning a wonderful year of learning and spiritual growth!